And after the plants came the animal life. There is no sort of land animal in the world, as there is no sort of land plant, whose structure is not primarily that of a water-inhabiting being which has been adapted through the modification and differentiation of species to life out of the water. This adaptation is attained in various ways. In the case of the land scorpion the gill-plates of the primitive sea scorpion are sunken into the body so as to make the lungs secure from rapid evaporation. The gills of crustaceans, such as the crabs which run about in the air, are protected by the gill-cover extensions of the back shell or carapace. The ancestors of the insects developed a system of air pouches and air tubes, the tracheal tubes, which carry the air all over the body before it is dissolved. In the case of the vertebrated land animals, the gills of the ancestral fish were first supplemented and then replaced by a bag-like growth from the throat, the primitive lung swimming-bladder. To this day there survive certain mudfish which enable us to understand very clearly the method by which the vertebrated land animals worked their way out of the water. These creatures (e.g. the African lung fish) are found in tropical regions in which there is a rainy full season and a dry season, during which the rivers become mere ditches of baked mud. During the rainy season these fish swim about and breathe by gills like any other fish. As the waters of the river evaporate, these fish bury themselves in the mud, their gills go out of action, and the creature keeps, itself alive until the waters return by swallowing air, which passes into its swimming-bladder. 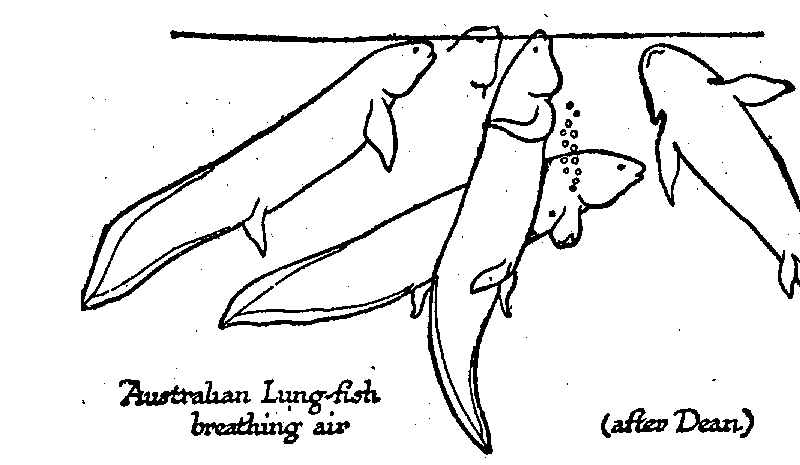 The Australian lung fish, when it is caught by the drying up of the river in stagnant pools, and the water has become deaerated and foul, rises to the surface and gulps air. A newt in a pond does exactly the same thing. These creatures still remain at the transition stage, the stage at which the ancestors of the higher vertebrated animals were released from their restriction to an under- water life. The amphibia (frogs, newts, tritons, etc.) still show in their life history all the stages in the process of this liberation. They are still dependent on water for their reproduction; their eggs must be laid in sunlit water, and there they must develop. The young tadpole has branching external gills that wave in the water; then a gill cover grows back over them and forms a gill chamber. Then as the creature’s legs appear and its tail is absorbed, it begins to use its lungs, and its gills dwindle and vanish. The adult frog can live all the rest of its days in the air, but it can be drowned if it is kept steadfastly below water. When we come to the reptile, however, we find an egg which is protected from evaporation by a tough egg case, and this egg produces young which breathe by lungs from the very moment of hatching. The reptile is on all fours with the seeding plant in its freedom from the necessity to pass any stage of its life cycle in water. The later Paleozoic Rocks of the northern hemisphere give us the materials for a series of pictures of this slow spreading of life over the land. Geographically, all round the northern half of the World it was an age of lagoons and shallow seas very favourable to this invasion. The new plants, now that they had acquired the power to live this new aerial life, developed with an extraordinary richness and variety. There were as yet no true flowering plants (Phanerogams), no grasses, nor trees that shed their leaves in winter (Deciduous trees); the first “flora” consisted of great tree ferns, gigantic equisetums, cycad ferns, and kindred vegetation. Many of these plants took the form of huge-stemmed trees, of which great multitudes of trunks survive fossilized to this day. Some of these trees were over a hundred feet high, of orders and classes now vanished from the world. They stood with their sterns in the water, in which no doubt there was a thick tangle of soft mosses and green slime and fungoid growths that left few plain vestiges behind them. The abundant remains of these first swamp forests constitute the main coal measures of the world today. Amidst this luxuriant primitive vegetation crawled and glided and flew the first insects. They were rigid-winged, four-winged creatures, often very big, some of them having wings measuring a foot in length. There were numerous dragon flies – one found in the Belgian coal-measures had a wing span of twenty-nine inches! There were also a great variety of flying cockroaches. Scorpions abounded, and a number of early spiders, which, however, had no spinnerets for web making. Land snails appeared. So, too, did the first known step of our own ancestry upon land, the amphibia. 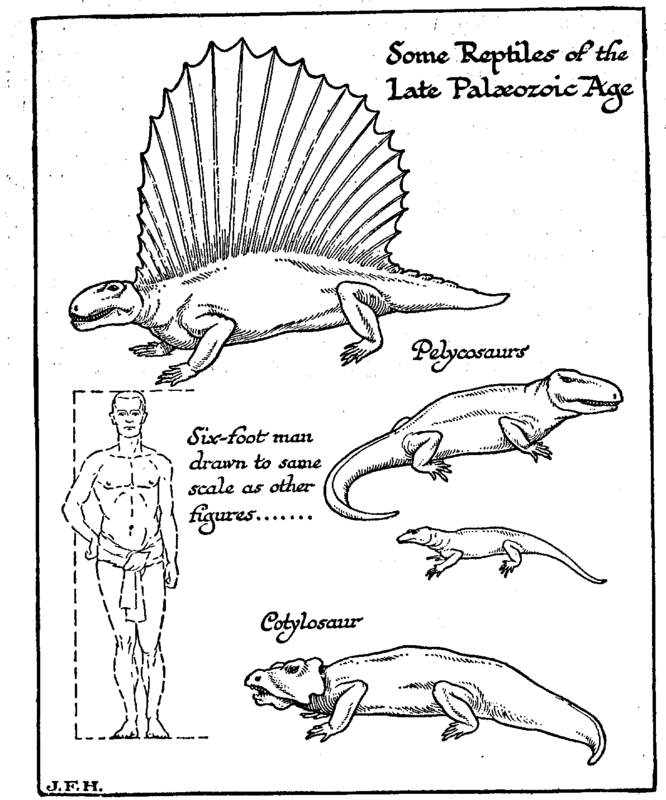 As we ascend the higher levels of the Later Paleozoic record, we find the process of air adaptation has gone as far as the appearance of true reptiles amidst the abundant and various amphibia. The land life of the Upper Paleozoic Age was the life of a green swamp forest without flowers or birds or the noises of modern insects. There were no big land beasts at all; wallowing amphibia, and primitive reptiles were the very highest creatures that life had so far produced. Whatever land lay away from the water or high above the water was still altogether barren and lifeless. But steadfastly, generation by generation, life was creeping away from the shallow sea-water of its beginning. This, says Mr. R. I. Pocock, has to be qualified. There were Carboniferous spiders with spinnerets, though they may have used the silk only for egg cases. And he thinks that the Carboniferous myriapods point to ground beneath the trees.